The grape harvest looks like suffering through the drought in Languedoc, specifically Aude, as described here: http://www.midilibre.fr/2016/08/14/occitanie-de-la-vigilance-a-la-crise-les-vignes-au-regime-sec,1379975.php#xtor=EPR-2-[Newsletter]-20160815-[Zone_info] I spoke to my tenant yesterday - there has been a profusion of 'bush fires' in the region and it has only rained twice since they took up residence on 01.06.2016. I wouldn't expect or want David Cameron to be of any help - he has already caused enough problems, however I think that it is important to let our parliamentary representatives know the depth of our feeling over this. We will see what we will see. Maybe Nick but I cannot take this decision lying down - my view is that the referendum was fundamentally flawed by reason of the lies told by the leave side and that a decision obtained through dishonesty and fraud cannot be regarded as true democratic decision and for that reason I do not accept it. To this end I have written to my MP - this does not become official until ratified by parliament - the chances are strong that they will but by the same token there is some chance if enough people make known their feelings by writing to their MP's that that they may at least pause and give the matter deeper thought. Add to this the much stronger possibility that Scotland will leave the Union and possibly Northern Ireland as well is bound to add something to their deliberations. So I feel that we should do everything possible to try and achieve a non ratification whilst the window is still open. The odds are against it but it is just possible people power may work and if the government can find a face saving formula to present to the public the day may be saved. If I were in a position of power my first port of call would be the EU Commission to inform them that the result is disputed and ask for time to sort it out. 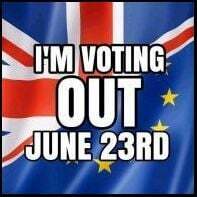 I was about in the 70's and that was the time Britain was described as the sick man of Europe since then we have made a lot of headway despite the credit crisis of 2008. I have also sent an E-Mail to the House of Lords for the attention of Lord Peter Mandelson - I still think our best chance is to continue to put the pressure on the Government whilst we still have a little bit of window. Not sure about sending one to David Cameron - he was the one who said he would abide by the result - what I am banking on is that the majority of MP's are pro EU and they may have their own minds on this. I have written to my MP suggesting that this referendum was fundamentally flawed by a deceitful leave campaign leaving people confused with a load of waffle, some of mit being hysterical. I think it might help if all of us on the remain side did this. My views are that if this is granted it should be properly supervised to ensure that the campaigns are honest, ethical and pertinent to the issue giving people positive and correct information to enable their choice. I would rather there not have been the necessity for a further ref and feel like I need one like a hole in the head but when you consider the alternative, to me it is the better choice. I realise my current attitude is likely to upset a lot of people but just is not in my nature to take things lying down. For your information should you decide to act on it. You probably appreciate that I'm as disgusted and angry with this whole sorry state of affairs as you but I honestly don't feel there is anything to be gained by looking for a second referendum. I doubt if anyone has the appetite or the will to go through this again and I'm not sure it would make any difference anyway. I think it also possible it may alienate even more people. I realise you may think this defeatist but I fear this the only practical way forward. Anyway good luck with whatever you attempt and I've signed the petition. I see your point but I have thought deeply about this and to be honest we had enough trouble with this one but if push comes to shove I would rather have one but this time have the campaigning properly supervised, say by a trio of three judges. It may not work but at least sending in the petition to parliament will give the MP's something to think about. There is also an outside chance that they may baulk at the idea of breaking up the UK which sounds as though it may be on the cards. If all else fails I will have to make further attempts to 'er indoors to move to France but she is resisting at the moment. I never dreamed of these problems when taking that met office course in the huts at Stanmore so many year ago. Waiting between Bishop Stortford and Harlow, to catch speeding drivers, a Police Officer sees a car puttering along the M11 motorway at 11MPH so he says to hims...elf: "This driver is just as dangerous as a speeder!" So he turns on his lights and pulls the driver over. Approaching the car, he notices that there are five old ladies, two in the front seats and three in the back...wide eyed and white as ghosts. The driver, obviously confused, says to him "Officer, I don't understand, I was doing exactly the speed limit! What seems to be the problem?" "Ma'am," the officer replies, "you weren't speeding, but you should know that driving slower than the speed limit can also be a danger to other drivers." "Slower than the speed limit? No sir, I was doing the speed limit exactly...eleven miles an hour!" ....the old woman says a bit proudly. The Police officer, trying to contain a chuckle explains to her that M11 is the road number, not the speed limit. A bit embarrassed, the woman grins and thanks the officer for pointing out her error. "But before I let you go, Ma'am, I have to ask...Is everyone in this car OK? These women seem awfully shaken, and they haven't made a sound this whole time," the officer asks. "Oh, they'll be all right in a minute officer. We've just come off the A120." http://www.theguardian.com/environment/2016/apr/07/clouds-climate-change-analysis-liquid-ice-global-warming?utm_source=esp&utm_medium=Email&utm_campaign=GU+Today+AUS+v1+-+AUS+morning+mail+callout&utm_term=165887&subid=14643256&CMP=ema_632 It may be worse than we think. I agree Knocker - if anything I think France upped their standard of play in this game, though were still unable to make the last metre to score a try. England was a little below par in some areas though very good in the lineouts but let themselves down by giving away too many penalties. Owen Farrell's kicking was not up to its usual high standard though many of these were from difficult angles, though he has scored with these in the past and I was considering him a Jonny Wilkinson MkII - we all get our off days and I expect an historical grand slam in prospect told on the nerves and at one time wondered whether the French would deny them this but a good finish pulled them through. Pleased that Dylan Hartley's injury was not too serious though he must have suffered concussion. Congrats to the English team for an overall excellent tournament. http://www.midilibre.fr/2016/02/27/alerte-meteo-le-gard-et-l-herault-places-en-vigilance-orange-pluie-inondation,1292330.php#xtor=EPR-2-[Newsletter]-20160227-[Zone_info] It looks like some pretty interesting weather coming up in Gard and Herault with up 150 mms of rain and at higher levels above 800 to 1000 metres, 80cm of snow. I reckon they will close the A75 with that. Obviously this was written by an anglophile who stayed for a few weeks, it is believed in Cornwall: AN AMERICAN VISITED THE UK AND THIS IS HIS DESCRIPTION OF BRITISH LIFE 11 Oct 2015 If you're from Britain it's quite easy to often forget how great this place is. If you're not from Britain, however, we probably seem like quite an odd bunch at times. The following Facebook post, written by 66-year-old American Scott Waters, pretty much fits both of the above. Penned following a visit to the UK this summer (most of which appears to have been in Cornwall, England), Waters wrote up the various cultural differences and posted them to the world of social media. The post promptly went viral and has been shared almost 50,000 times. Here's what he had to say about us: I was in England again a few weeks ago, mostly in small towns, but here's some of what I learned: * Almost everyone is very polite. * There are no guns. * There are too many narrow stairs. * The pubs close too early. * The reason they drive on the left is because all their cars are built backwards. * Pubs are not bars, they are community living rooms. * You'd better like peas, potatoes and sausage. * Refrigerators and washing machines are very small. * Everything is generally older, smaller and shorter. * People don't seem to be afraid of their neighbors or the government. * Their paper money makes sense, the coins don't. * Everyone has a washing machine but driers are rare. * Hot and cold water faucets. Remember them? * Pants are called "trousers", underwear are "pants" and sweaters are "jumpers". * The bathroom light is a string hanging from the ceiling. * "Fanny" is a naughty word, as is "shag". * All the signs are well designed with beautiful typography and written in full sentences with proper grammar. * There's no dress code. * Doors close by themselves, but they don't always open. * They eat with their forks upside down. * The English are as crazy about their gardens as Americans are about cars. * They don't seem to use facecloths or napkins or maybe they’re just neater than we are. * The wall outlets all have switches, some don't do anything. * There are hardly any cops or police cars. * 5,000 year ago, someone arranged a lot of rocks all over, but no one is sure why. * When you do see police they seem to be in male & female pairs and often smiling. * Black people are just people: they didn't quite do slavery here. * Everything comes with chips, which are French fries. You put vinegar on them. * Cookies are "biscuits" and potato chips are "crisps". * HP sauce is better then catsup. * Obama is considered a hero, Bush is considered an idiot. * After fish and chips, curry is the most popular food. * The water controls in showers need detailed instructions. * They can boil anything. * Folks don't always lock their bikes. * It's not unusual to see people dressed differently and speaking different languages. * Your electronic devices will work fine with just a plug adapter. * Nearly everyone is better educated than we are. * If someone buys you a drink you must do the same. * Look right, walk left. Again; look right, walk left. You're welcome. * Avoid British wine and French beer. * It's not that hard to eat with the fork in your left hand with a little practice. If you don't, everyone knows you're an American. * Many of the roads are the size of our sidewalks. * There's no AC. * Instead of turning the heat up, you put on a jumper. * Gas is "petrol", it costs about $6 a gallon and is sold by the liter. * If you speed on a motorway, you get a ticket. Period. Always. * You don't have to tip, really! * There are no guns. * Scotland, Wales, Ireland and Cornwall really are different countries. * Only 14% of Americans have a passport, everyone in the UK does. * You pay the price marked on products because the taxes (VAT) are built in. * Walking is the national pastime. * Their TV looks and sounds much better than ours. * They took the street signs down during WWII, but haven't put them all back up yet. * Everyone enjoys a good joke. * Dogs are very well behaved and welcome everywhere. * There are no window screens. * You can get on a bus and end up in Paris. * Everyone knows more about our history than we do. * Radio is still a big deal. The BBC is quite good. * The newspapers can be awful. * Everything costs the same but our money is worth less so you have to add 50% to the price to figure what you're paying. * Beer comes in large, completely filled, actual pint glasses and the closer the brewery the better the beer. * Butter and eggs aren't refrigerated. * The beer isn't warm, each style is served at the proper temperature. * Cider (alcoholic) is quite good. * Excess cider consumption can be very painful. * The universal greeting is "Cheers" (pronounced "cheeahz" unless you are from Cornwall, then it's "chairz") * The money is easy to understand: 1-2-5-10-20-50 pence, then-£1-£2-£5-£10, etc bills. There are no quarters. * Their cash makes ours look like Monopoly money. * Cars don't have bumper stickers. * Many doorknobs, buildings and tools are older than America. * By law, there are no crappy, old cars. * When the sign says something was built in 456, they didn't lose the "1". * Cake is pudding, ice cream is pudding, anything served for dessert is pudding, even pudding. * Everything closes by 1800 (6pm) * Very few people smoke, those who do often roll their own. * You're defined by your accent. * No one in Cornwall knows what the hell a Cornish Game Hen is. * Soccer is a religion, religion is a sport. * Europeans dress better than the British, we dress worse. * The trains work: a three minute delay is regrettable. * Drinks don't come with ice. * There are far fewer fat English people. * There are a lot of healthy old folks around participating in life instead of hiding at home watching tv. * If you're over 60, you get free TV and bus and rail passes. * They don't use Bose anything anywhere * Displaying your political or religious affiliation is considered very bad taste * Every pub has a pet drunk * Their healthcare works, but they still gfuqhgfpjh about it * Cake is one of the major food groups * Their coffee is mediocre but their tea is wonderful * There are still no guns *They have towel warmers! Agreed Knocker - formed the opinion that neither France nor England showed prospect of winning the Grand Slam on their showing. England are still giving away far too many penalties. You may be right in saying that it is first game nerves, so let's hope they settle down to give us a good tournament. Once more my flabber is ghasted - the cherry tree in my back garden is now in bloom - before the end of January! A bit of snow and that'll be the cherry on the... no Mapantz! Yes, the temps are warming up here for the weekend, up to double figures - wondering if I will be able to go gliding on Sunday but suspect there may be some low cloud which may put the mockers on that. We had about a centimetre at Watford, still cloudy, mostly alto stratus - snow slowly thawing. We've had just sufficient of the wet stuff to colour the back lawn and the tops of cars white, still light snow falling. Still above freezing. Slight snow at Watford, settling in patches in the rear garden but no more than a dusting and still above freezing. The mind boggles - I had always thought that nothing could escape from a black hole but it may be that the following may contradict this: https://uk.news.yahoo.com/nasa-telescope-spots-something-coming-out-of-a-084232766.html We think we are getting a good idea of how things happen and then this! Looking at different charts, possibly different geographical regions (I was speaking of Watford) and a difference in the timing of events - as I said in the 'EDIT' a week is a long time in Meteorology, especially since the weather has a mind of its own. As far as the European cold is concerned at the moment it is mainly confined to the central, east and north but even now central Europe seems to be warming a tad, so this does not appear to be encroaching as far west as I had hoped, in fact it may recede east. It has only been like this for a few days so far and probably not yet deeply entrenched, even though a min of -28C has been recorded at St Petersburg. Having said all that it is sometimes surprising the way weather events can evolve quite quickly and catch us all out. Can't see anything of real interest on the Meteo Ciel Charts - there is a brief period when we get uppers -4 to -6C with the jet stream briefly to the south. There is a Greenie high for a short while ridging over to Scandinavia but that is too far north to do us at Watford any good. I think the best I can hope for on the basis of this is some wintry showers during the course of next week which probably will not settle as lying snow. Pity in a way because I thought the low temps currently in East Europe, Scandinavia and Russia might encourage a high to build in that location but the forecast charts do not show encouraging news. towards all men and women, together with their families. same to you and your, Mike.